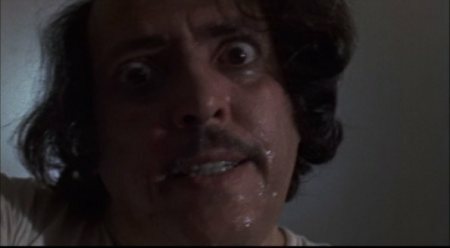 William Lustig’s ‘Maniac’ is an unconventional slasher film compared to its peers offering a lot more weight (and no, I am not talking about Joe Spinell’s hefty frame). This is a movie that I would call a character study slasher. Yes, you read it right. Character, study and slasher are three words that would not normally fit into the same sentence but here we have a film summed up perfectly with those very words. Spinall plays Frank Zito an Italian-American middle-aged overweight loner and the landlord of a small apartment building in a nameless borough of New York City. 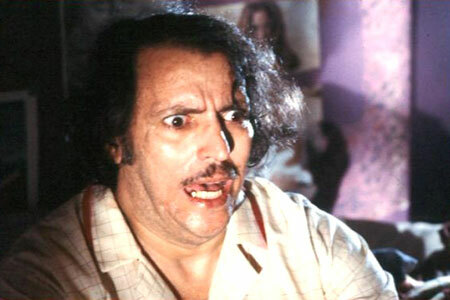 He is also an unassuming schizophrenic serial killer who ventures out at nights killing women and scalping them. Taking the scalps back to his grotty little room, he uses them to decorate his collection of female mannequins. One new scalp = one new mannequin and sleeping with each one for several nights he carries out conversations with them to communicate with his deceased mother who was a prostitute who physically abused him as a child and left him orphaned when she died in a car accident. When every seven nights is up he poses each mannequin up around his apartment and goes out to kill again. One afternoon in a park, he notices a young woman taking his picture a fashion photographer named Anna. Tracking her down after getting her address from her purse, instead of killing her he begins dating her when he becomes impressed with artwork she has done. Unsurprisingly things do not work out between them. Whereas other movies of the ilk usually focus on a lone survivor and the supporting characters of the soon to be victims ‘Maniac’ focuses wholly on the antagonist of Frank. Seen entirely through his point of view we are thrust into the deep dark chasm of his madness. There are no real protagonists here we have only the company of a deranged lunatic for the whole duration of the running time. The late Joe Spinall co-wrote and co-produced the film and did a lot of primary and secondary research for the role. He spoke to psychiatrists, spent hours watching videos and went through newspaper archives about murders in New York. What is truly fascinating about his portrayal of Frank is that there is no clear distinction between good and evil. Over the course of the movie, Spinall aided by some solid direction from Lustig shows different layers to the character bit by bit. His evil acts should make us hate him but then more of his human side is revealed to draw our sympathies. He is a sad lonely soul and what with the supplement of a morose musical score that is often touching with its emotional flute pull you in it helps to enforce our empathy for Frank. Sure, he commits atrocities with the women he brutally kills but the mental damage received from years of abuse as a child and his bereavement with the loss of his mother the inflictor of his pain has not completely washed away his humanity. We see another side to him a sympathetic character that cries for his mother and can even be charming and polite in the company of others with genuine sincerity as opposed to the growling stalking murderer of women. He does not torture his victims and when he kills them it is not sexually motivated but out of loneliness in the want of his mother. Therefore, what we have here is both the monster and the victim all rolled into one. We are not given an easy task in what we should be feeling. These contradicting personality traits also make the character of Frank very unpredictable and even more frightening for that as we never know what he is going to do. Opposed to forcing us to empathize with Frank, Bill Lustig paints a harsh and unforgiving New York of 1980 creating a world that shows little empathy itself. I cannot help but think that maybe this is where John McNaugton took his inspiration for Henry: Portrait of a Serial Killer another slice of life character study of a deranged murderer. I wrote in Henry: Portrait of a Serial Killer (1986) and the Genesis and Execution of Evil: “Throughout the course of the entire film, McNaugton purposely does not include one law enforcement officer on screen. While the movie is indeed realistic this also contributed to the presentation of a bleak harsh world a seemingly lawless one stripping us of any comforts that we might feel from seeing a police officer as Henry and Otis roam freely to dispatch in the most gruesome of ways whomever they feel like.” It is very much the same here in ‘Maniac’ as we see on the TV in Frank’s apartment sensationalized news reports of his gruesome crimes but yet never once on screen do we ever see anything done about it. Warning! To avoid a spoiler do not read the rest of this paragraph. Not until Frank himself stops his own reign of terror with a self-inflicted wound do the police turn up at his door after a presumable phone call from Anna. Frank is very much the result of his own environment with the apathetic New York the symbolization of his isolation. His emotional wounds are wide open to such harsh surroundings that he is all alone in. His mind and the city are both broken; he is an uncontrollable psychopathic rage of violence in a world that cannot stop him. Lustig employs punky guerrilla techniques in filmmaking with natural lighting to build a world for him that is his prison. The entire film is encapsulated in the bleakest atmosphere. There is no hope for him even when he starts to lay the foundations of a relationship with Anna who should help bring normality to his life but he instead falls deeper into the void of his insanity. The violence in ‘Maniac’ that is some of the most powerful murder set-pieces ever committed to celluloid emphasize upon this mean spirited nature. These sequences are uncompromising in the visualization of gore and the imagery that defines this graphic destruction of the human body in the highest potency is the Son of Sam inspired “Disco Boy Scene”. It is shot in three different camera angles in slow motion with William Lustig using the natural lighting technique in this night scene lit just entirely by the headlights of a car. 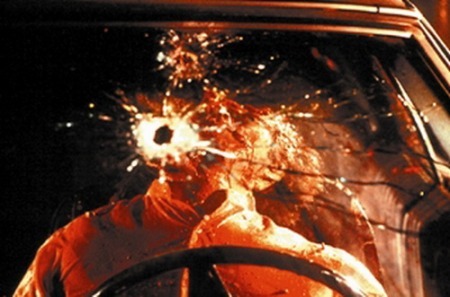 Frank takes a running jump onto the bonnet of this car with a shotgun crouches down and aims and blows to bits the head of a disco dancer (Tom Savini) in the driver’s seat. It is stomach churning to look at but at the same time you cannot turn your head away in fascination of how sublimely executed it all is. Its SFX artist Savini a Vietnam War veteran drew from his own experiences in witnessing the horrific results of such wounds and he captures that perfectly in its gruesome realism. The movie is far from perfect though as it is riddled with flaws playing out all the old inconsistencies in logic that horror fans have all come to love and groan about when it comes to the slasher i.e. the victims are about as bright as a packet of cigarettes. It is such a shame that these common negative components of the sub-genre were not addressed and rectified because it is obvious in other departments that there is a great deal of intelligence here. 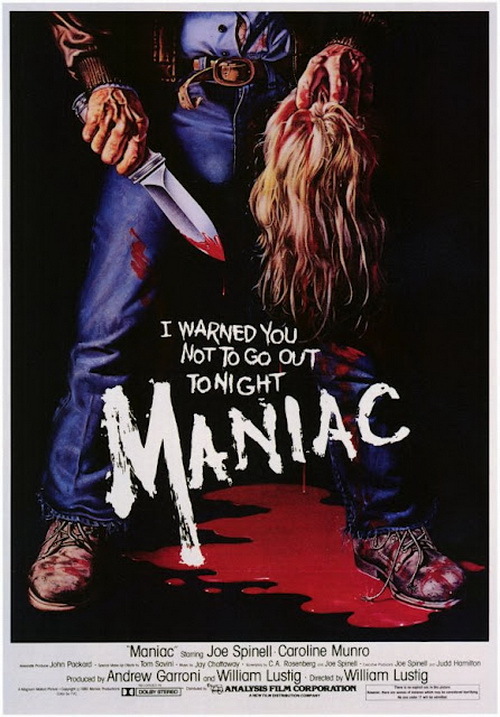 However, Joe Spinall’s compelling performance and the combination of Lustig’s grimy visuals and Tom Savini’s ultra-realistic special makeup effects are what makes ‘Maniac’ a piece of the most shocking cinema not easy to digest and is equally unforgettable. Disturbing and unpleasant this is an uncomfortable viewing experience in the most potent exploitation of sub-human depravities and an emotionally honest and depressing analysis of the traumatized consequences of child cruelty and abandonment. Outstanding analysis, and opinion. Lustig really has a knack for grimy, doesn't he? Thank you very much, Bozo. 'Manic' is certainly a "grimy" affair that its director has a unique flair for. Excellent stuff Dave, I enjoyed your piece so much I grabbed the film off the shelf and give it a spin - not having seen the film in a good few years now. 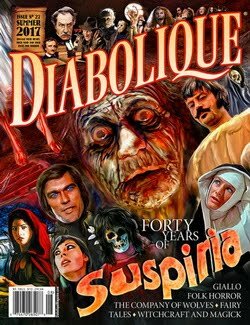 It's interesting that the film is considered something of a classic these days, when I first saw the film in the early 90's, the film was getting regularly panned, even by the Horror community, often called vile and disgusting and if I remember rightly one reviewer claimed the film was made by pornographers. 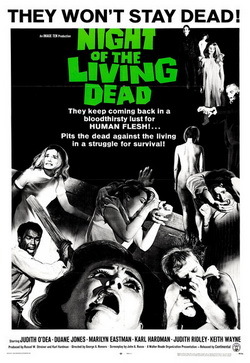 I always enjoyed the film I must say, long before I picked up the Elite DVD, I had to contend with the cut Intervision pre-cert tape, and even in this version which was shorn of most of the bloodletting, the film still had a nihilistic power - surely the acid test for a great Horror picture. 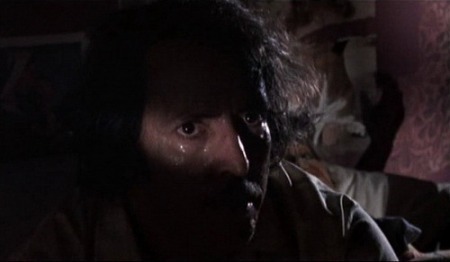 I think William Lustig has always acknowledged that Joe Spinell was the driving force behind the film, steering what might have been just another cheap, schlocky slasher into a genuinely thoughtful character study. 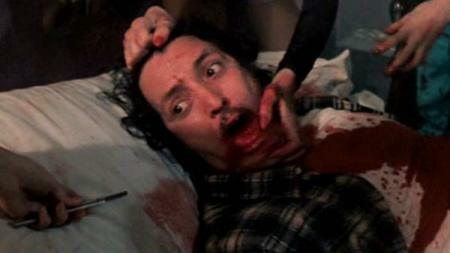 I think Spinell took inspiration from Taxi Driver (which he appeared in) but I would consider the film part of a tradition that might include Deranged, The Toolbox Murders, the 1977 British thriller, The Black Panther, and as you rightly mentioned Henry: Portrait of a Serial Killer. If there's one fault line in the film that I can't overlook is the sheer implausibility of Frank's relationship with Caroline Munro's fashion photographer - I just can't imagine how a slob like him could get pally with a hip NY artist. My two favourite set pieces are the assault on the parked car lovers, and the final sequence where the victims take their revenge - didn't Don't Go In The House rip this off ? And I must mention of Jay Chattaway's excellent score. Excellent piece, and right on target. Good job!